Editor's note: Seven days after this story was published in BloodHorse Daily, The Sydney Morning Herald published a story on alleged animal cruelty investigation into the ATC Mounted Unit. BloodHorse is investigating the story. Update: Racing New South Wales released the following statement March 3: "Racing NSW Stewards (March 3) opened an inquiry into complaints lodged relative to the treatment of horses under the care of the ATC Mounted Security Division. After taking evidence from a number of witnesses the inquiry was adjourned to a date to be fixed, at which time additional witnesses will provide evidence." A group of off-track Thoroughbreds in Sydney, Australia has found a second career not too far from their first one. The Australian Turf Club's Mounted Security Division, which was formed in 2010 to patrol race days and other events at the four area tracks, uses former racehorses as their mounts of choice. It was an easy decision to use Thoroughbreds for the ATC, which conducts racing at Royal Randwick, Rosehill Gardens, Canterbury Park, and Warwick Farm. Not only are former on-track competitors athletic and able to handle the demands of police work, but it gives the industry a chance to provide a second career for former runners at familiar locations. "The (Australian) industry is really behind rehoming their horses and (those involved) are actively looking for suitable post-racing homes," said Dennis Mitchell, the general manager of security risk and investigations for ATC. "Racehorses have a great work ethic, as a result of their early training. This, combined with Thoroughbred heart, courage, and stamina makes them ideal for mounted security work," he added, mentioning that using mounted officers who are experienced horsemen also cut down on the risks associated with patrolling a stable and racetrack area. Some racegoers may even recognize the patrol horses from their days on the track. Although not all off-track Thoroughbreds will be suitable for police work, Mitchell described the unit's "open door policy" to evaluate potential new mounts. Because of this they have received horses from well known stables, including Godolphin's Australian outfit and trainers Anthony Cummings, Kevin Moses, Lee Curtis. In a neighboring unit, the New South Wales Mounted Police, 2005 Doncaster Handicap (G1) winner Patezza remains on patrol. "Apart from social media, we rely on word of mouth within the racing industry," Mitchell said on finding potential new mounts. 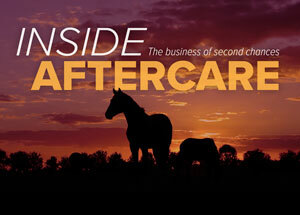 "We tend to have an open door policy for all off-track Thoroughbreds. Then we will assess their soundness and temperament, which are essential criteria for prospective security horses." In addition to a physical presence through racedays and events at the track, the mounted unit also maintains an active social media presence on Facebook, Twitter (@ATCMounted), and Instagram (@atcmountedsecurity). Their posts give behind-the-scenes and humanizing looks at a variety of activities, showing what these equine officers are capable of. In one post they may be greeting racegoers or doing sensory training and in another they're riding an elevator up to a rooftop party or appearing in a photoshoot with models. "Our mounted team was featured on an episode of 'Australia's Next Top Model,'" Mitchell said, quickly adding that in addition to the horses' police work they also participate in community service. "A further, important aspect of the horses' work is visiting senior citizens' homes and other care facilities, where the presence of these magnificent creatures invariably inspires great joy."